The LSW321BT BLACK+DECKER 20V MAX* SMARTECH Sweeper quickly clean up sidewalks, garages and more with this sweepers 130 MPH of debris-clearing power. The SMARTECH battery delivers 25 minutes of runtime, can be managed remotely via app, and even has a portable charger to charge your mobile devices for ultimate convenience. The BLACK+DECKER app links with your SMARTECH batteries so you can locate, lock and monitor your tools for convenience and safety. You can also use the built-in USB port on your SMARTECH battery to conveniently charge your phone and devices at home or on the go. Part of ECHO's best-in-class X Series line, the PB-8010 backpack blower for the serious professional. It's a beast that you can handle. A 79.9 cc 2-stroke engine provides the highest blowing performance available. Coupled with a lightweight, innovative carbon-fiber frame you don't sacrifice control when battling the biggest leaves and debris. 58V Cordless Backpack Leaf Blower, BP750i Powered by a 58V lithium-ion rechargeable battery, the all-new Jonsered BP750i backpack blower is capable of incredible high-velocity air speeds up to 150 mph and airflow up to 750 cfm to easily handle the toughest blowing tasks like clearing wet, heavy leaves, grass, and other stubborn debris. The battery-powered, brushless motor provides the power, performance, and runtime typical of traditional gas-powered equipment - without the hassle of mixing and storing fuel or harmful emissions. Other impressive features include instant push-button starting with no pull cord, variable speed control, digital cruise control, and integrated power boost technology. It has an ambidextrous design that works for left or right-handed users, and also features a heavy-duty frame; contoured, adjustable shoulder straps; and padded, load-reducing harness for optimal fit, superior comfort, minimal strain, and reduced fatigue for users of any size. 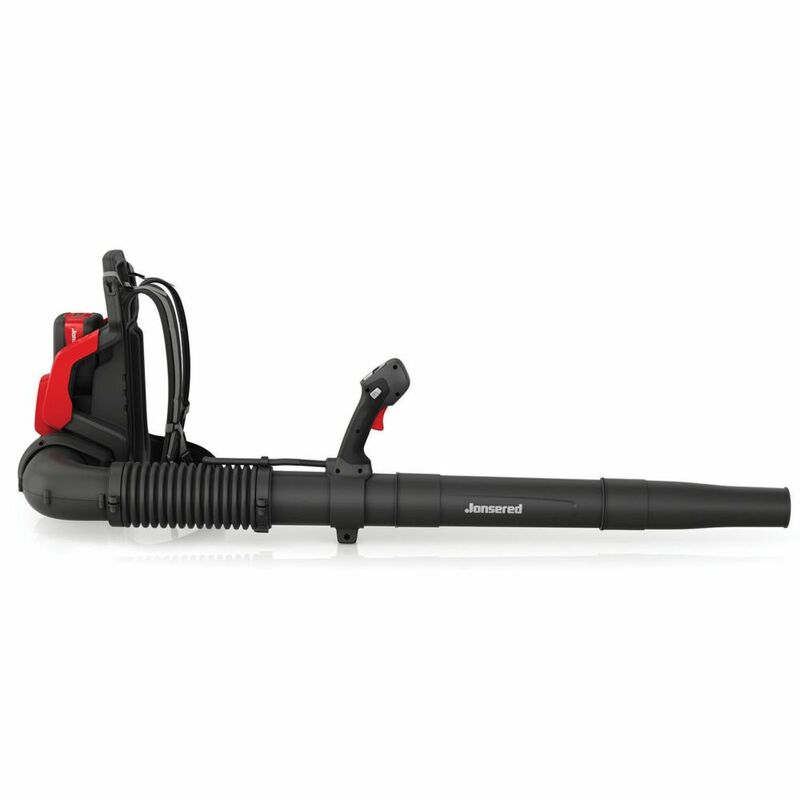 58V Cordless Backpack Leaf Blower, BP750i is rated 3.0 out of 5 by 2. Rated 5 out of 5 by Yug1 from Extremely reliable This machine has more power than most cordless machines.I like its simplicity--no gas no oil and I do not have to worry if it will start.